I love this kitchen gadget! First of all, it's constructed well and one thing that is so super cool is that the blades fit in a little drawer on the side so that you have everything together. No more hunting down the blades or finding somewhere to store them. It works on all kinds of fruits and vegetables but since we eat healthy about twice a week (hey, it's a start) we started out with potatoes. To be honest, I'd gotten to where I didn't eat fries much (another good thing) anymore. It's like I got tired of them. However, we tried this and wow, the taste reminds me of getting something like a famous restaurants fried onion except with potatoes. I like mine less crispy and my husband likes his really crispy so we each had our own potato and used the curl blade. It takes seconds to use and we can make most anything with it. We're totally pleased and can't wait to use it more. We posted a video and while I'm no videographer, you can get the idea of how well it works. I received this product at a discount for an unbiased review. You can get it here for yourself. I love glass and while this is a paperweight magnifying glass, it looks beautiful on my coffee table. Honestly, I hate to admit that my eyes aren't what they used to be but they're not. This comes in handy to read small print but best of all, I can have it sit on the tabletop when I'm not using it and it looks like an art piece. Hey, I may look like I'm 30 but I think I have the eyes of a 70 year old - and not the "I'm still perfect" celebrity eyesight either! 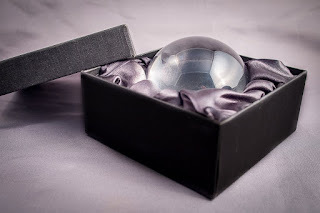 It came in a really nice gift box and I was more than pleased with the shipping and the product itself. The glass is well made and has a heavy construction but not too heavy to use, of course. I just mean that it does not feel cheap whatsoever. While I received this at a discounted rate for an unbiased review, this is something I'd definitely have paid full price for. I was recently able to try out these flameless candles and I love them so far. They are real wax so not only do they look like regular candles but they feel like them too. The candles come with a remote control and all you have to do to set them up is take them out of the box, turn on the bottom buttons, pull the safety tab out of the remote, and that's it. They look great in the daytime and especially in low or no light. I live in Florida so we get plenty of thunderstorms and even tropical storms and hurricanes sometimes and guess what - the lights go out. While we have regular candles, these are much safer and more convenient. I keep the remote in my entertainment center drawer so I don't lose it and it's there whenever I want a pretty light or need it when the lights are out. I posted a video and yes, it's very amateur but here it is. You all know we have dogs but what you may not know is that we have leather seats in our trucks (a Hummer H2 and a Nissan Frontier) and while we love taking our doggies with us, we don't want ripped up seats, which can happen. I have found the perfect solution - the Devoted Doggy Premium Quilted Front Seat Cover for Pets. This seat cover is pretty darn awesome. It has waterproof material and a non-slip backing with seat anchors. It works so much better than the usual towels we'd put down because it won't slip around. I was immediately impressed with the packaging when I got it. It's not some cheap product just thrown together; this is a really professional item with quality construction and premium materials. It's easy to put on your seat and they have a 100% lifetime guarantee. What more could you want in a seat cover for your pets? Keep in mind that this fits most vehicles. You do have to have a head rest and it fits 23" wide which includes most cars, trucks, and SUVs. For us, it works perfectly. I sometimes write regularly for an online company that does beauty products reviews so I now know a lot about ingredients, including hyaluronic acid. When I got a chance to try this, I jumped right on it - knowing that hyaluronic acid is an important ingredient in skin care. So far, I love it. It literally only takes a few drops to use so this bottle will last ages. It doesn't go on greasy at all and within seconds, your skin feels silky smooth. There's no real scent to it and I like how well it seems to work. Believe me, I try all kinds of products and this one is a keeper. The product is 100% natural and doesn't contain any GMO's, fillers, preservatives, or allergens. It works as a moisturizer and helps the skin to fight the natural aging process. The bottle is a 2oz size and has a convenient dropper to use for application. Again, be careful because a little really goes a long way so you don't need to squirt a bunch out because you'll only waste it. My skin feels hydrated and very soft so check it out and see what you think. I received this product at a discounted price for an unbiased review. 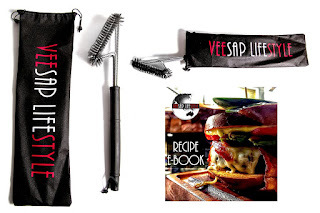 I recently had the opportunity to try out the Barbecue Grill Brush By VeeSap Lifestyle and it was a definite welcome addition in my home. Living in Florida, we honestly grill out multiple times each week and my husband just got a brand new gas grill for Christmas so keeping it clean is a priority. When we received the grill brush, the first thing I noticed was how quality it is. This isn't just a brush in a box - it came with a utensils bag as well. Oh and the brush - let me say that this thing is amazing. It's extremely sturdy and has excellent construction - overall, I was amazed at how awesome it looks. The handle is 18" inches long and has an ergonomic weather resistant design that makes it comfortable to use. We like to sear meat and the brush has this twisted wire surface that helps to quickly remove any burnt on residue - not that we burn anything since we love rare steaks and burgers but it's there when you do need it. It's safe on your surfaces, easy to clean, sturdy and durable, has quality construction, and so far, we just love it. If you love to grill out as much as we do then you need the right tools and this is definitely a must-have. *I received this item for an unbiased review.